Fireplaces add a lot of character and charm to homes as they create welcoming environments both indoor and out. The Empire OP42FP32MN Carol Rose Outdoor Stainless Traditional Premium Fireplace is one such fireplace. Created for outdoor use, its stainless steel finish in a traditional style harmonizes with any design or color palette. Constructed using high-quality materials, its Harmony burner produces up to 50,000 BTUs to keep the entire area warm and cozy. It also includes an on/off MV and standing pilot/piezo. 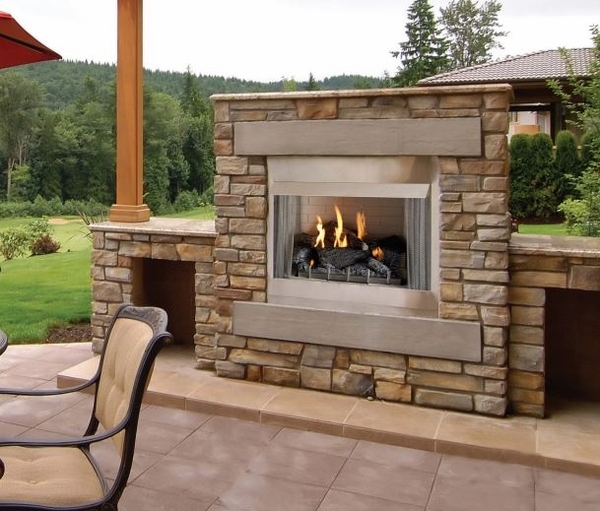 This fireplace accepts 30-inch outdoor wildwood refractory logs and is remote ready; both the logs and the remote can be purchased separately. Use this fireplace for a space measuring 43.5" (W) x 37.62" (H) x 19.81" (D). Does this come with a pergola? Can I put regular logs in this? What all is included with this product? The product listed is the fireplace only (stainless steel box with burner), and the unit is not listed for burning wood.